The boys at RSGC have a lot of unique personalities, so it’s no surprise that the many of clubs on offer cater to everyone. 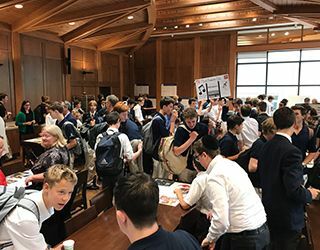 In the Junior School, 15 clubs like Chess, Programing, Mind and Body Health, and Creative Textile Arts run from Monday to Thursday; while in the Senior School, there are about 25 clubs including Poker, Math, Climbing and Gender Studies that allow the boys and teachers share their passions. The year started off with a Senior School Club Fair during which the boys could promote their clubs. The nicest part about clubs is that it allows boys who may not otherewise have a chance to step into a leadership role while doing something they love. Take Gavin Bell in Grade 12. He has been at the College since Grade 3, yet has never started a club. He started the Fashion Club this year when he realized he wanted a forum to talk about fashion with a group of guys. His plan is to talk about runway fashion, fashion trends and news associated with the industry. Gavin’s long-term goal is to collaborate with the girls’ schools on a fashion show. Gavin is impressed by the support the school gives when it comes to forming clubs. Boys must play on a team or participate in a club each term and receive house points for doing so. In addition to having fun, there are many reasons why RSGC makes clubs such a big part of school life. “They gain a lot of important life skills, including leadership, organizational and problem solving,” said Tim.